An artificial reef is composed of any unnatural object like fiberglass, treated wood, metal, rubber, plastic, concrete, etc. (Langhamer, Olivia, Dan Wilhelmsson, and Jens Engstrom 2009). 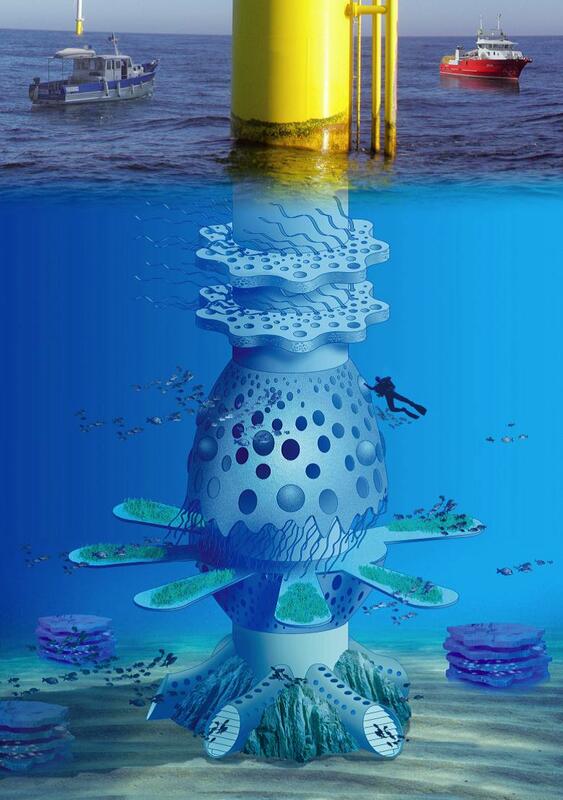 The physical structure of ocean energy devices can act as artificial reefs which provide many ecological services characteristic of natural reefs. Some of these services include protection from predators, shelter, nurseries, food sources, habitat rehabilitation, and fishery stimulation. All of these services combine to increase the density, biomass, and biodiversity of ocean species (Brendan J. Godley, et al 2009). Although any object can operate as a shelter to foster activity, the design of the object can be specifically directed to encourage biomass and biodiversity growth. The Lysekil Project is a study performed at a wave energy farm off the coast of Sweden. The goal of the project was to determine if holes in the wave power foundations influenced the settlement of creatures there. Some of the foundations were drilled with holes while others were left smooth and the site was observed after a 2 to 3 month colonization period. 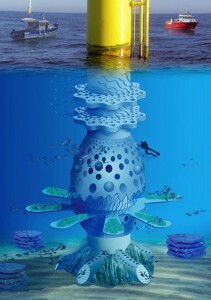 Scuba divers and researchers collected data, took samples, and examined photographs to conclude that the design of the structures can be catered to encourage species richness in an area. There was a significantly greater quantity of fish and crabs associated with the foundations than with the undisturbed areas and an even higher quantity was associated with the designed foundations. Edible crabs particularly thrived as seen in the graph below due to their preference of holes as habitats. Many species benefited from the added structural complexity, but it must be noted that some did not. For example, the star fish population decreased because they preferred smooth, uninterrupted habitats and its’ predators flourished in the holey habitats (Langhamer, Olivia, and Dan Wilhelmsson 2009) These results not only show that design is a key factor, but that ecosystem manipulations produce complex results. However, understanding these results can help maintain and create sustainable ecosystems. 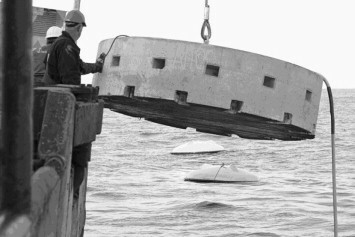 Structures acting as artificial reefs can also be known as Fish Aggregation Devices (FADs) which are floating objects that stimulate fish activity specifically for capture. This increases populations and supports fisheries. Since over 333 fish species associate at least one stage of life to floating structures, carefully designed ocean energy devices could fuel fisheries (Dempster, Tim, and Marc Taquet 2007). Researchers are also exploring an aquaculture design for wind turbines off the coast of Trafalgar, Spain. Both options increase fish populations, jobs, and a food source (Besio, G., and M. A. 2008). Seemingly far-fetched from fishing, ocean energy projects could by de facto create marine protection areas. Due to high structural density, fishers would be deterred from energy generating areas for fear of collision or entanglement of gear. This would prevent harmful fishing methods like trawling, re-nourish benthic biota, and build a haven for fish. Marine protection areas could, however, help support fisheries by providing a space for overall fish population growth. Specific types of scour protection could be used to enhance the local population around the offshore wind farms. It appears that if bricks were used as scour protection, more crustaceans would be attracted to the area, while rocks could attract more sea bass (Lacroix and Pioch, 2011). This information could be used to choose the scour protection based on the local ecosystems. If this was done, the artificial reefs located around the wind turbine foundations could help increase the populations of threatened or endangered species. According to Boeuf (2010), habitat destruction remains the first cause of biodiversity loss for 67% of endangered species. Therefore, future wind projects could be built in areas where endangered species need more habitat and wind farms would provide the needed habitat. In addition, usually the scour protections around the wind turbine foundations usually only adds horizontal habitat, but there is a potential that different structures could be included in the vertical direction, potentially creating different habitats along the monopile (Lacroix and Pioch, 2011). 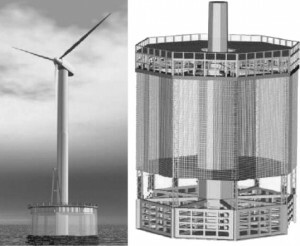 A potential vertical structure on a wind farm monopile to create different habitats. In addition, a study showed that offshore wind turbines could become an attachment point for aquaculture facilities. Buck et al. (2008) showed that rearing blue mussels and seaweeds would be biologically feasible around wind farms in the German North Sea. However, more research on the economic costs and benefits and technicalities of including aquaculture around wind turbines is needed. Despite the many positive attributes of physical structures for ocean ecosystems, there are, of course, problems. As seen by the star fish example, some species fare worse with added structure. There is also an increased opportunity for non-native species colonization and algal blooms. (Brendan J. Godley, et al 2009) In 2012, Skeate showed that the construction effects of the Scroby sands offshore wind farm, such as the noise produced during pile- driving, could have caused the population of harbour seals to decrease, but the populations of the grey seal to increase. This suggests that pinnipeds can hear the construction noises created and that some are more affected by the noises than others (Skeate, 2012). Finally, there is simply a loss of ocean floor space. As with most fields, and especially critical for growing ones like ocean energy, there is a need for more research. Many articles agree and show that some of greatest gaps in research lie in the opportunity for FADs (Dempster, Tim, and Marc Taquet 2007). Each location must be uniquely assessed due to the vast varieties of conditions, but hopefully, results would facilitate the construction of clean ocean energies that also promote biodiversity for the environment and for humans.